Leading independent power producer focused on utility-scale solar and storage projects, has closed $235 million in total financing for 120MW portfolio. Coronal Energy partnered with Gulf Power, the U.S. Air Force, and the U.S. Navy to build 120 MWac of solar PV across three sites in Northwest Florida, providing clean and resilient power to 18K homes. Supporting the Department of Defense and its goal for energy resiliency elevates the importance of our work and we’re proud to attract substantial capital to this marquee project. Today Coronal Energy, a leading independent power producer focused on utility-scale solar and storage projects, announced that it has closed $235 million in total financing, which includes tax equity and debt, for its Gulf Coast Solar Center portfolio. The Gulf Coast Solar Center is a 120-MW, three-site portfolio in Northwest Florida built for Gulf Power in cooperation with the U.S. Navy and U.S. Air Force. Finance partners include Marathon Capital, which served as Coronal’s exclusive financial advisor for placement of the tax equity funding for the portfolio, U.S. Bankcorp Community Development Corporation (USBCDC), and Sumitomo Mitsui Banking Corporation (SMBC). 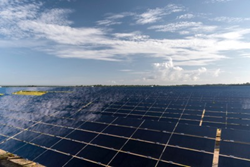 The 120-MW Gulf Coast Solar Center includes three sites in Northwest Florida: a 30-MW project at Eglin AFB Reservation, a 40-MW project at NAS Whiting Field’s NOLF Holley, and a 50-MW project at NAS Pensacola’s NOLF Saufley. Spanning more than 900 acres and comprising more than 1.5 million solar panels, the Gulf Coast Solar Center portfolio generates enough electricity annually to power roughly 18,000 homes and reduce CO2 emissions by 3.5 million tons over the 25-year life of the project. Construction of the portfolio created nearly 450 jobs, with 98% of that workforce hired locally. The Gulf Coast Solar Center is now fully operational, following an August 2017 ‘Flip the Switch’ ceremony with Gulf Power, the U.S. Air Force, the U.S. Navy, and other project partners. Coronal Energy, powered by Panasonic, is a leading independent power producer providing turnkey solar energy solutions tailored for diverse enterprise customers across North America, including utilities, corporations, and the public sector. It unites the financial strength of a Fortune Global 500 company (#110) and Panasonic’s award-winning history of solar innovation and sustainability leadership with the project development, finance, engineering, construction, and asset management experience of Coronal Energy. The result is smarter solar that translates to smarter business for customers. The collective experience of Coronal Energy, powered by Panasonic, includes projects in 40 states totaling 2.3 GW, with more than 3.4 GW of greenfield and brownfield projects under construction/contract or in development. For more, please visit CoronalEnergy.com and follow on Twitter @CoronalEnergy. With $26.3 billion in managed assets as of Dec. 31, 2017, U.S. Bancorp Community Development Corporation, a subsidiary of U.S. Bank, provides innovative financing solutions for community development projects across the country using state and federally sponsored tax credit programs. USBCDC's commitments provide capital investment to areas that need it the most and have contributed to the creation of new jobs, the rehabilitation of historic buildings, the construction of needed affordable and market-rate homes, the development of renewable energy facilities, and the generation of commercial economic activity in underserved communities. Visit USBCDC on the web at USBank.com/cdc.